Students read Meet the Artist! Alexander Calder by Patricia Geis, an interactive pop-up book about Calder's life and artworks. Students examined Calder's various styles of art from Mobiles to Primary Color Paintings to Recycled/Found Art. Students will be interpreting Calder's styles by making and manipulating their own mobiles, experimenting with organic and geometric shapes in primary color paintings, and collecting and rearranging found materials to assemble sculptures. Students will evaluate their own work throughout the process. February is Heart Month. The Elementary schools are Jump Roping for Heart in P.E. and Wellness classes. 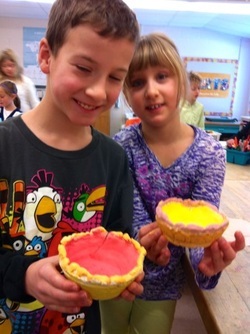 Students celebrate Valentine's Day, as a way of showing kindness to each other. 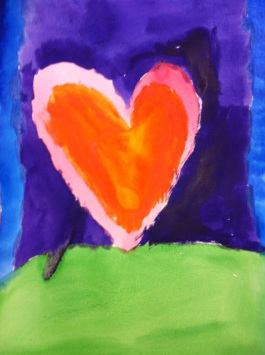 In Art, students explore the Art Elements of Shape and Color by creating heart watercolor paintings using warm and cool colors. 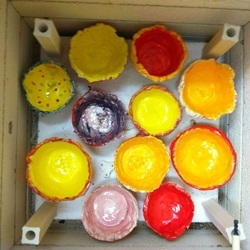 Students will begin the process of making coiled pots using spirals as part of their design. While exploring form, students will practice clay techniques. Once the pots have been completed, they will air dry. Clay that is wet, leatherhard, or completely dry is known as greenware. After the pots are completely air dried, they will be fired slowly in the kiln into bisqueware. After the bisqueware firing, the pots will be glazed with dinner safe glaze. Glaze is made up of sand, glass, and pigment. The glaze fire will be the final firing. Coiled pots have been smoothed out inside. The outside maintains the coil and spiral designs. These pots are ready for a glaze firing. Glazed coiled pots inside the kiln. Students are always curious to see what the interior of a kiln looks like. The four square posts are called "stilts." Stilts provide the option of adding shelves to accommodate several pieces of pottery. Students created a collaborative class tree by making their own marks in the form of a dot and the use of tempera paint. The tree is inspired by Wassily Kandinsky, a Russian artist who explored shape and color. As a means of an informal critique, each student described the tree with a word written on a Post-It note.